When the Superintendent of the New Castle Area School District announced the appointment of Dr. Jacqueline Respress as Principal of a combined New Castle Junior/Senior High School, it would be the first time in the District’s 150-year history that a female has been chosen to lead the senior high school, and the first time an African American has reached this pinnacle. 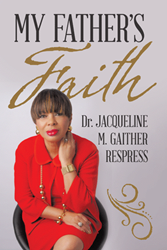 In her new book, “My Father’s Faith,” author Dr. Jacqueline M. Gaither Respress blends personal narratives, research on education and spirituality, quotes and scriptures to first, show how the strength of her Christian beliefs, passed on to her by her father, have sustained her through life’s trials. Secondly, Dr. Respress uses her own story to map out a hopeful path for anyone experiencing obstacles in life. Throughout “My Father’s Faith” Dr. Respress shares gripping stories such as the miracle of her son’s birth, from weighing only 2 lb. 10 oz. to growing strong and healthy and eventually going on to earn a PhD from Baylor College of Medicine. Dr. Respress is a lifetime educator who has worked in her community to provide educational, financial and spiritual support to children and their parents. After having a fulfilling career as an educator, Dr. Respress retired from the New Castle Area School District to care for her 91-year-old mother full time. Dr. Jacqueline M. Gaither Respress, now retired, earned a master’s degree in education and a doctorate in educational leadership. Her career in education includes positions in western Pennsylvania as a teacher, principal and part time professor. She and her husband, Rev. Torrance Respress, live in the Houston metro area.